Are you seeking greater clarity of vision and purpose? Do you value clear thinking, clear communication, and clear direction? Are you passionate about learning, growing and living in alignment with your vision and purpose? Could you benefit from working with committed professionals who for more than 20 years have guided executives of 75 nations to their ‘next levels’ of leadership, innovation agility, and personal growth? If your answer is ‘Yes’, the Clarity Academy is for you. Clarity offers you versatile, highly experienced thought partners who work with you to access your own wisdom and take you to your next level, and beyond. There are programs for Individuals, Coaches and Enterprises. Come explore, discover and learn as we partner with you in your journey to greater clarity. We look forward to meeting you. Welcome! 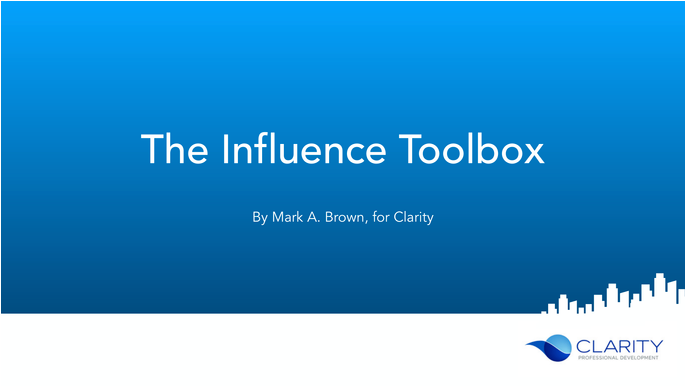 The Influence Toolbox develops influential, credible and confident leaders for private- and public-sector firms as well as for NGOs. Engage effectively with customers, colleagues, stakeholders, and the public with the tools and awareness of a collaborative, innovative driver of change. Are you seeking greater clarity of vision and purpose? Do you value clear thinking, clear communication, and clear direction? Could you benefit from working with committed professionals who for 20 years have guided executives of 75 nations to their ‘next levels’ of leadership, innovation agility, and personal growth?